I will be the first to admit that I am the biggest trash talker on turkey burgers. In fact… in 99% of cases I find them utterly disgusting. The other 1% is almost totally consumed by these asian turkey burgers I discovered last year that I go through huge phases with. I mean, HUGE phases. Like phases where I make eight of them on Sunday and eat them for two meals a day in different ways and finish them off by Wednesday. Which is just crazy considering I’m pretty sure the whole reason I hate turkey burgers to begin with is because I unknowingly entered into a marriage four years ago where turkey burgers were center stage and center stage only for the first, oh… I don’t know… six months? Uh huh. I had my fill. If turkey burgers are covered in cheddar and bacon and ketchup and avocado OR gorgonzola and bacon and maybe some sort of fabulous aioli, then I might be down. But then I’d also probably just want beef instead? Sooooo yeah. Right now a burger like that is my power meal. Which means, um… that I am just loving it? That I make it for others and feel powerful? I guess. Not to be confused with one’s power song, in which case if you’re wondering – my current one is Kelly Clarkson’s Catch My Breath. Oh my gosh. I hate myself for how many times I have had this song on repeat the last five days. It’s utterly horrifying. And so incredible. I’ve been screeeeeaming this song. Spontaneous dance parties and singing into a large wooden spoon? Triple check. Back to the positive side of turkey burgers since I’m forcing one down your throat today. You know I’m nuts over this thai sauce combo I came up with a few months ago and when it came to putting it in a burger? Turkey just sounded right. So I did that. And even put some slaw (yes, like raw vegetables) on top that contained peanuts (which sounds weird but is completely perfect) and placed the entire thing on a toasted bun and ate it. I live a wild life. Begin by combining all the ingredients together for the sauce: the sweet chili sauce, rice vinegar, coconut milk, brown sugar, garlic cloves, peanut butter, ginger, lime juice and soy sauce, and whisk until combined and fairly smooth. Scoop out about 1/4 cup of the sauce and set it aside. Place the rest in a small saucepan and bring to a boil, then reduce to a simmer and cook for 3-4 minutes until slightly thickened. Set aside. To make the slaw, quickly throw together the cabbage, carrots, cilantro and peanuts, tossing well. Add 3-4 tablespoons of the sauce, then toss well to coat. Add additional sauce if desired. 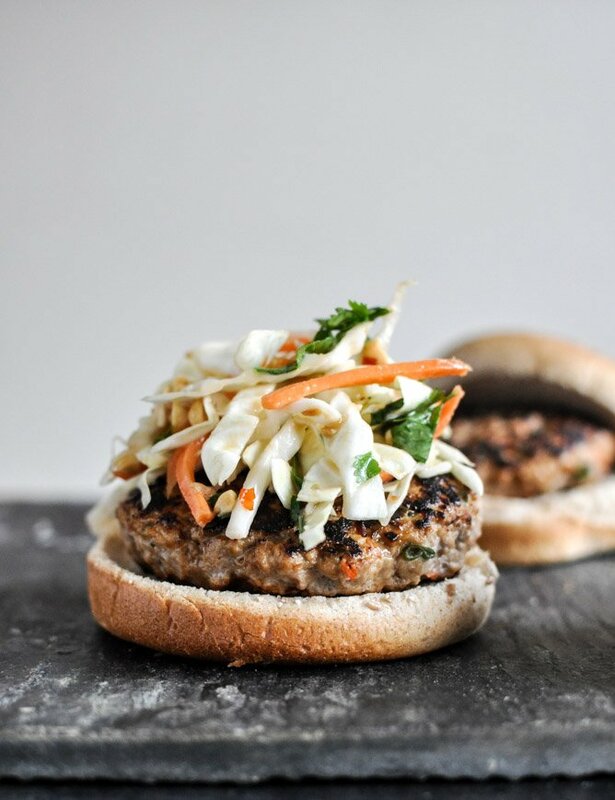 Place each burger on a bun and top with a heaping spoonful of the slaw and additional sauce if desired. I discovered this recipe hereabout a year and a half ago and make it regularly. It’s such a well written recipe!!! No matter what “Dammit I forgot to buy _” alterations I have to make last minute or what I screw up. 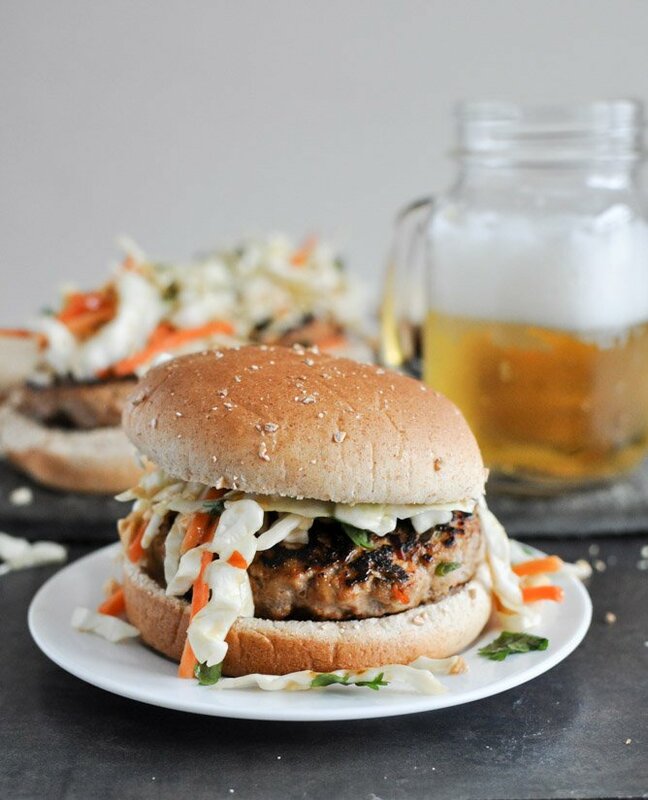 My husband loves it and he hates the very concept of turkey burgers because it implies health. 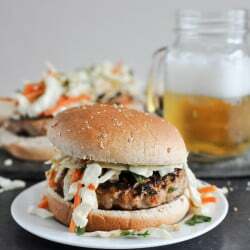 We eat the leftover slaw on the side, I always make double or triple the sauce and freeze batches because the “simmered” sauce tastes fine mixed into future turkey burger batches, and substitute lemon for lime when I have to and 1/4 tsp ground ginger for fresh when I have to and it’s always always good. Also I made the slaw and added strips of chicken marinated in the sauce and cooked on the stove to the top like a salad and it was good that way too. I like it best exactly the way you wrote it but it’s a truly awesome recipe. I pinned this recipe a while back and finally made it for dinner tonight. My husband, who ONLY likes traditional beef burgers, LOVED them! The grocery was out of ground turkey breast so I used ground turkey thighs. They were delicious!!!!! So juicy and full of flavor! Thanks for a great turkey burger recipe! So I know the coconut milk is part of the Thai flavor, but it will also kill me, sooo…any suggestions on what to replace it with in this recipe? Does the sauce require something thick for consistency? Thanks for any advice you can give. I love Thai food, but have to make it for myself now that coconut has become an issue.